Morocco is situated in northwest Africa, overlooking the Mediterranean Sea and the Atlantic Ocean, it is famous for its fantastic landscapes, romantic atmosphere, richness and diversity, so the Moroccan interior design reflect these ideas in its designs, it is characterized by intricate sculptures and arched doorways colored fabrics and mosaic that are famous all over the world. 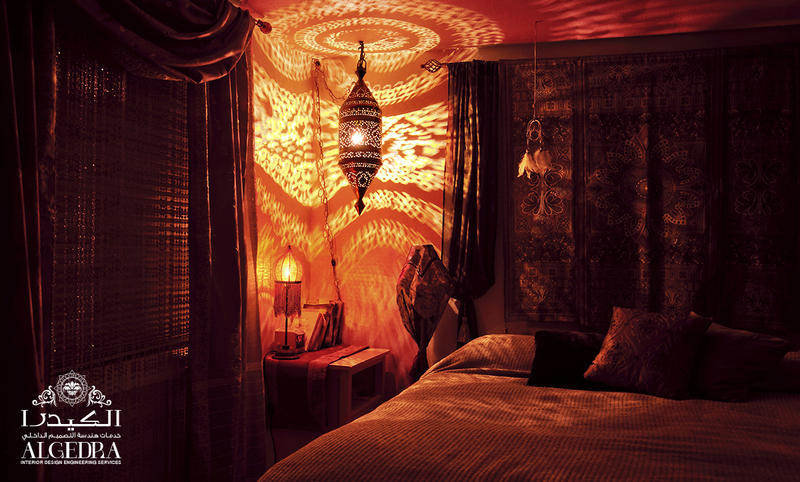 Here are some examples of the Moroccan interior design. 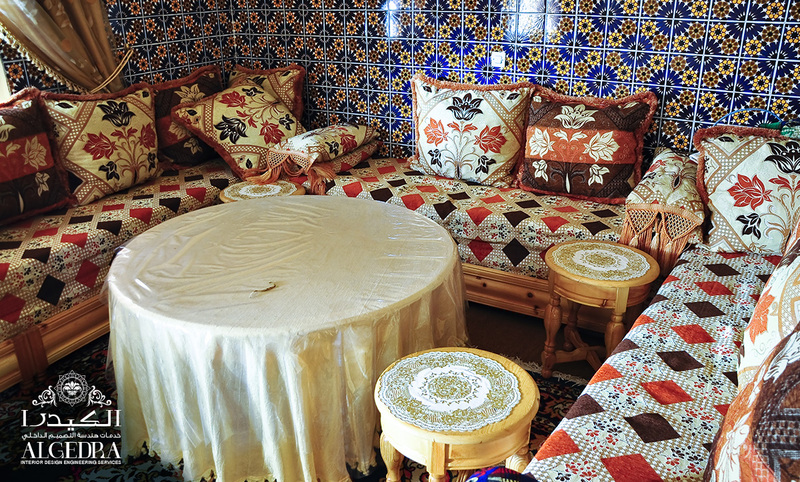 Moroccan designs include a lot of bold and vibrant colors like orange, red, green, blue, light brown, yellow, silver. It has a lot of natural plants in its designs also the wonderful geometric and floral decorations inspired by the Islamic culture, which fascinates minds. In the sitting rooms, the Moroccan Majlis is characterized by its vibrant colors, the furniture ores are of natural silk or cotton, and decorated with beautiful carvings, you can use hanging lanterns of different shapes and colors, a trendy Majlis can use modern furniture with a carpet, or lanterns and some accessories. In the bedrooms, strong bold colors are what distinguishes the Moroccan style, using cotton raw materials and silk in bed linens, traditional rooms use warm pastel colors and furniture with traditional carved wood that radiates originality in the room but in the modern rooms they use a modern style bed but the mattresses are of strong colors, motifs are used on the walls or floor, or even in some decorations. 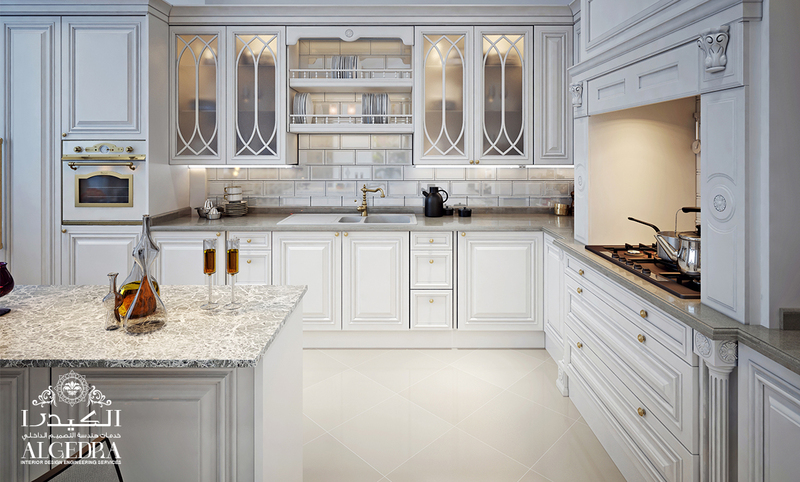 In kitchens the Moroccan style can be used in decorations and accessories, also the Moroccan mosaic and motifs of cool colors can be used in the kitchen to give the kitchen a joyful and elegant look, it is also possible to use the Moroccan decorations on the kitchen cabinets, will make it so luxurious and elegant too. In bathrooms’ tiles or marble with Moroccan inscriptions are used, and the lighting lamps are of a Moroccan-style too, you can use warm colors like yellow and light brown, gold, so to get a stylish and luxurious bathroom, with a large wall mounted mirror and a table that has Moroccan inscriptions.